This program is a complete solution for helping you roll out Verifast to your members, and includes everything from staff training to a fully branded video for promoting and educating your account holders about this exciting new service. You will have a dedicated Beavercreek Marketing Consultant to help manage your campaign. This starts with a kick-off call where your assigned consultant will gather information about your goals and will create a comprehensive marketing plan and timeline for your campaign. The Beavercreek Marketing Staff Training course is included in the program, for no additional charge. Staff training is delivered through a secure online portal. Program administers can modify the course, manage access and track staff progress. The course trains your staff on the overall benefits they and your account holders will enjoy with your new Verifast palm authentication service, as well as more in-depth details on registering members and using the service for authentication. 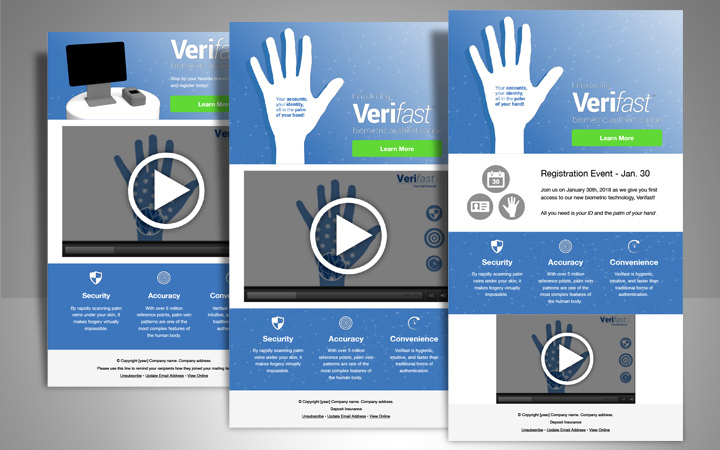 As part of the program, you will receive branded Verifast OEC videos for promoting Verifast and teaching your members about the registration process. A full length (1:30) and a social media (:30) video will be branded, hosted and streamed to your members using the Beavercreek Online Education Center and it’s embed video player. This includes a custom video embed banner ad, that will be created and coded for you to match the look and feel of your website. The Verifast Member Rollout Campaign comes with a variety of marketing communication templates for print and digital distribution. These templates can be used in developing out your own marketing collateral, or Beavercreek can customize and fulfill any combination of the available pieces. The Verifast Member Rollout Campaign is an optional add-on that can be selected or added to your Fiserv Verifast product agreement. For more information, contact your Fiserv Representative or Beavercreek at info@beavercreekmarketing.com.